Bacon may be America's current favorite pork product, inspiring countless 21st-century memes and t-shirt slogans, from "You had me at bacon" to "Keep calm and put bacon on." But the passion for cured pork stretches far back through history—and to many other parts of the world. Salted pork belly first appeared on dining tables thousands of years ago in China. Pork curing methods spread throughout the Roman Empire, and Anglo-Saxon peasants cooked with bacon fat. Until well into the 16th century, the Middle English term bacon or bacoun referred to all pork in general. The word bacon derives from various Germanic and French dialects, including the Old French bacun, Old High German bacho (meaning buttock) and Old Teutonic backe, which refers to the back. But the cut typically used to make bacon comes from the side, or belly, of the hog. In modern England, a side of bacon is called a "gammon" and a thin slice of bacon is known as a "rasher". 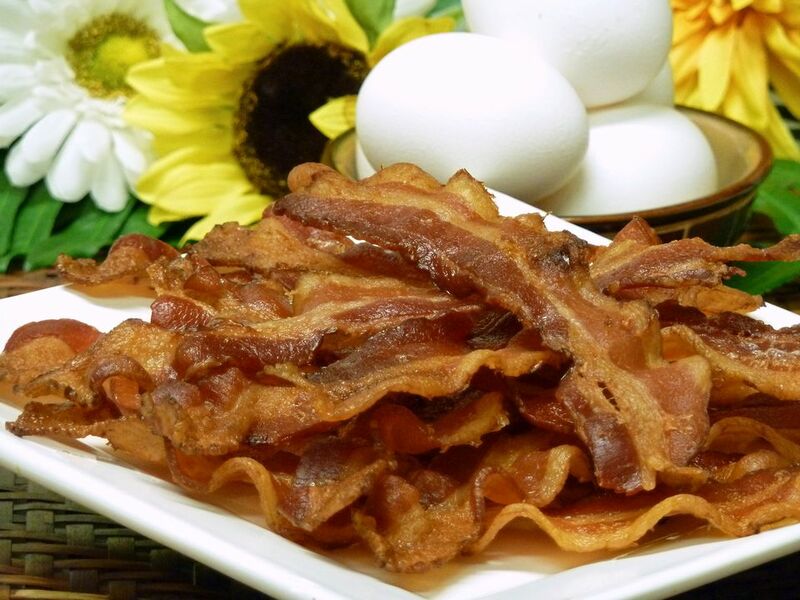 In the 12th century, a church in the English town of Great Dunmow promised a side of bacon to any married man who could swear before the congregation and God that he had not quarreled with his wife for a year and a day. A husband who could "bring home the bacon" was highly regarded by the community for his forbearance. Queen Isabella sent eight pigs to Cuba with Christopher Columbus, but the National Pork Board credits Spanish explorer Hernando de Soto as the "father of the American Pork Industry." He brought 13 pigs to the shores of the New World in 1539; within three years his herd had grown to 700. Native Americans reportedly fell in love with the flavor and readily accepted pigs and pork products as peace offerings. By 1653, a rapidly expanding, free-roaming and unruly swine population nearly thwarted Dutch construction of a wall on Manhattan Island meant to keep the British and Native Americans out of New Amsterdam. The site later became known as Wall Street. Pigs continued to run wild in New York City into the 19th century. In a health-conscious age, you might expect to find fatty bacon low on the list of preferred foods. But Americans are eating more pork now than they have in decades—and as anyone who dabbles in pork belly commodities can tell you, bacon can singlehandedly boost the pork market. Americans eat 70 percent of their bacon with breakfast, but the crispy, salty meat also stars as a sandwich ingredient and a favorite of chefs in fine dining establishments— causing bacon shortages and price hikes at times. Still, bacon remains a bargain when it comes to adding flavor. Bacon aficionados enjoy the cured meat in everything from classic dishes like chowders to more adventurous concoctions such as bacon ice cream, chocolate-covered bacon, and bacon jam. With low-sodium and lean varieties available, even a dieter can partake in moderation. Where Does Ham Come From?